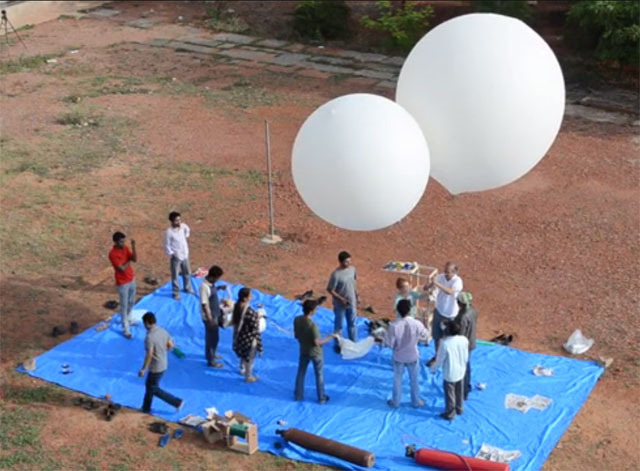 An amateur radio balloon operating on 145.765 MHz will be launched on Sunday, September 29, 2013 from Bangalore, India. National Institute of Amateur Radio, Hyderabad with Dhruva Space, India’s first small satellite start-up, is supporting the Indian Institute of Astrophysics with its high altitude balloon campaign to study the comet ISON. The Helium filled balloon plans to launch in early Sunday morning from the Hoskote campus of the Indian Institute of Astrophysics, Bangalore. The payload will carry a 145.765 MHz APRS packet radio transmitter and a GPS GSM tracker, both of these are extremely important in keeping track of the balloon in flight, as it rises up to 40 km reaching the upper stratosphere. NIAR are extensively involved in the efforts of tracing and safely recovery of the payload. On the afternoon of September 29 there will be a presentation given on “Amateur Radio For High Altitude Ballooning” by Dhruva Space. Mr S.Ram Mohan, VU2MYH, Director, National Institute of Amateur Radio will speak on APRS technologies for tracking.